Who is West Texas Swing Sets? Our policy is a 30 day, no cost to you, return of our swingset if you are not happy with your purchase. We will pick it up at no cost to you!! Not even Shipping! I have been building wooden swingsets now for 30 years and have sold these swingsets in the United States and 7 other countries. We sold our first company in 2007. We recently entered the industry again with our new company West Texas Swingsets. The internet store we have created at this website is revolutionary in the Wooden Swingset industry. We are the first, with our patent-pending process and pallet/floor, to be able to ship direct to you the customer, a complete play set 80% ASSEMBLED…Shipping direct from our Factory-Warehouse to your home. We have no middleman-retailer, saving you hundreds and even thousands of dollars while at the same time giving you a Specialty Swingset at the lowest cost possible! These 5 Swing Sets are the result of 30 years of listening to our customers needs. Take a look at our Quality and Pricing. Watch the short videos. 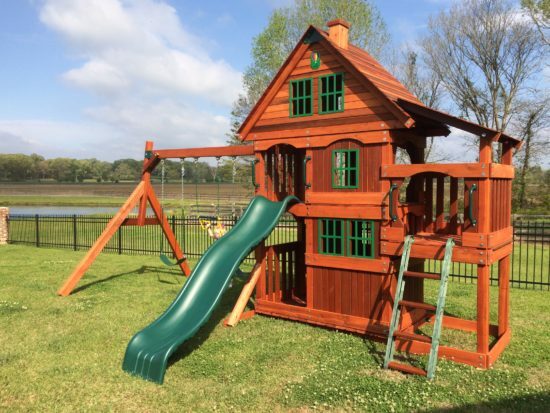 I guarantee you will be 100% satisfied with our wooden playsets and the ease of installation.